I’ll agree that it’s cold but a part of me is waiting, knowing that this weather is just an appetizer. I am a bit scared but it really just means I can cuddle up at home and crochet until spring. But, because I do have to venture out – why can’t I just hermit like a practical woodland creature? 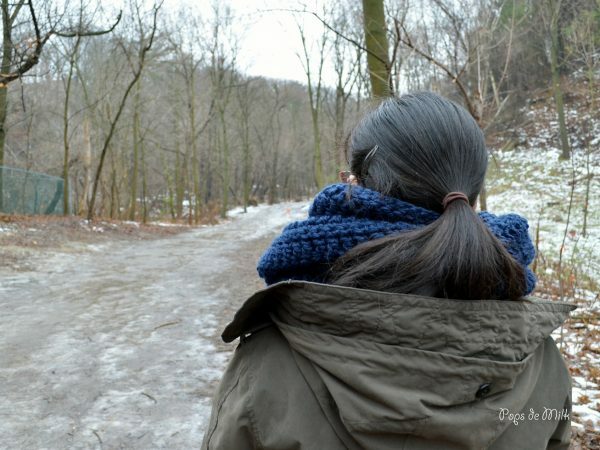 – this weather gives me the inspiration to fight back with a thick and cozy infinity scarf. 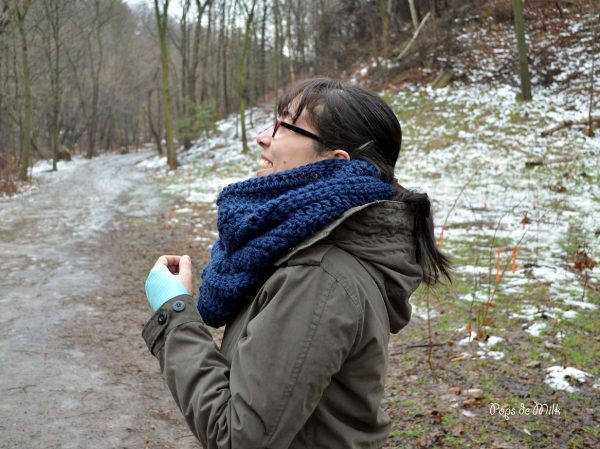 This scarf was made with Bulky (5) acrylic yarn and a large hook. My tension was relaxed because I wanted the fabric to have a soft and luxurious feel – who doesn’t want that wrapped around their neck? When choosing the yarn and hook for this project I decided to use bulky yarn so it would work up quickly (it’s not getting any warmer, let me tell you). 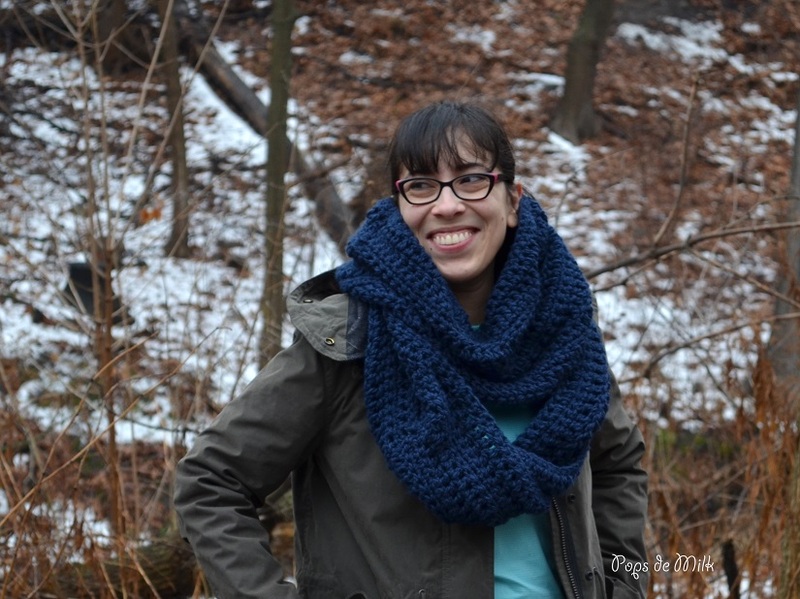 The pattern for this scarf is great for new crocheters who are stepping into the world of double crochet! 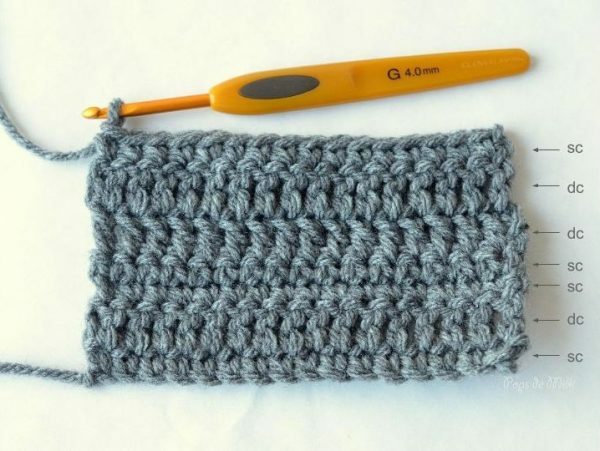 There’s even a post on how to double crochet here. This project is also great for those who are wanting a soothing, no-thinking, Netflix-and-crochet kind of project. The scarf can be modified very easily. The size can be adjusted to however long or wide you prefer, just add or remove foundation chains and add or remove rows. You can make a different fabric by using a different yarn and hook, as well as adjusting your tension. Starting chain does not count as stitch. Make first stitch on top of last stitch from previous row/same space as starting chain. 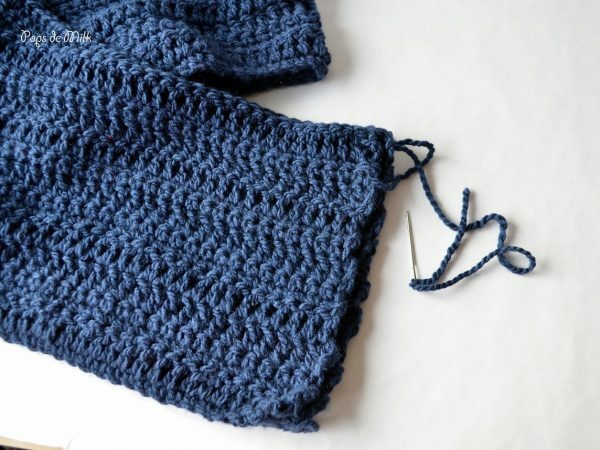 Repeat Rows 1-7 once more or until scarf is approximately 10-12 inches wide or desired width. This is what the pattern sequence looks like – I made a swatch using a lighter coloured, worsted weight yarn so it’s a bit easier to see. Fasten off and leave a long tail for sewing the seam. For this scarf I simply folded the project in half and sewed the seams together with a yarn needle. 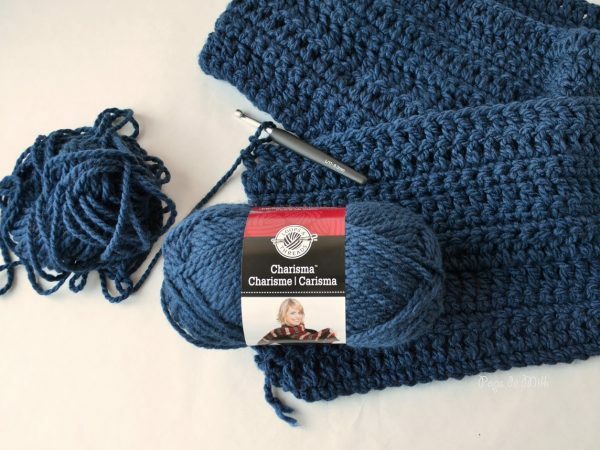 I’m a beginning crocheter and looking forward to making your beautiful scarf as my second project. (Yay). But, i have a couple of questions. In Row 1, you say to sc in 2nd chain and then turn. Did you mean to say sc in 2nd chain, sc across and then turn? Also, in Row 2, I’m not sure I understand dc in “same space as starting chain”. Would you clarify?